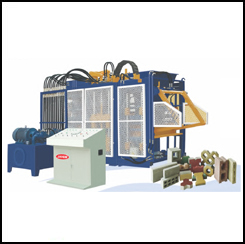 At Jayem Manufacturing, we offer a comprehensive range of high quality machinery like automatic block making plant for building materials for various construction requirements. 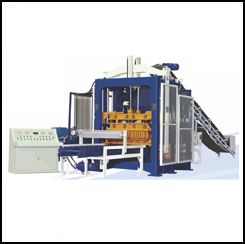 Made of quality raw material and using modern manufacturing techniques, our block making machine pass through stringent quality control checks to ensure strict adherence to industry standards and parameters. 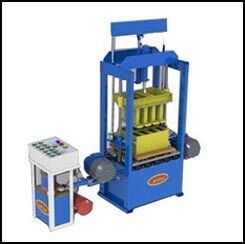 Available at most reasonable prices, our products like fly ash brick making plant, tile press, etc. are known for their high performance, efficiency, ease of use and durability. 15 H.P. electric motor for press. Capacity - 4,000 blocks per day of size 40*20*20 cm./equivalent power. Material feeding and product stacking automation possible. Mould Area 750 x 500. PLC controlled, operating drives from pallet magazine to produce output on other side of machine. 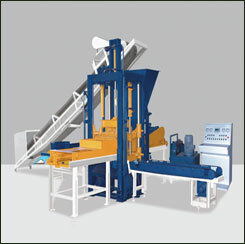 Pan mixer for face mix and bottom mix for both conveyors. High quality due to vibration under hydraulic pressure. Versatile, since it can produce solid blocks/ pavers/ kerb stones as well as Hollow blocks and other precast elements.